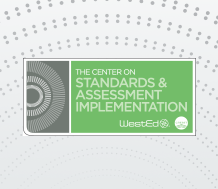 The Center on Standards & Assessment Implementation (CSAI) provides state education agencies and Regional Comprehensive Centers with research support, technical assistance, tools, and other resources to help inform decisions about standards, assessment, and accountability. Subscribe to CSAI E-News and receive the latest on resources, upcoming events, and more from the center. The CSAI is directed by WestEd.